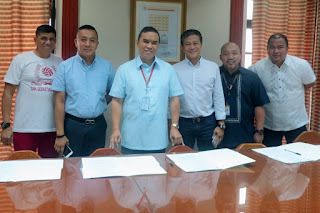 Foton Motor Philippines, has further widened its commitment to the development of Filipino athletes by supporting the San Sebastian College Athletics program. Foton is currently fielding teams in the Philippine Super Liga (PSL), Filsport Basketball Association (FBA) and the local triathlon scene and has been very open about its confidence in the abilities of the Filipino athlete. In the most recent addition to the Foton sports program, Mr. Rommel Sytin, President of Foton Motor Philippines, signed an agreement to support the San Sebastian College Athletics program and help in the continuous success of the program in various sports. The San Sebastian Stags has been one of the consistent powerhouse teams in the National Collegiate Athletic Association (NCAA) and with the support of Foton, the administration hopes to further improve their program to hone more talents not only for school pride but also to represent the country in various international competitions.